Roseanne Barr returned to television on Tuesday night with ABC's revival of "Roseanne," the sitcom that made the comedian a household name nearly two decades ago, only this time her character is an avowed supporter of President Donald Trump. 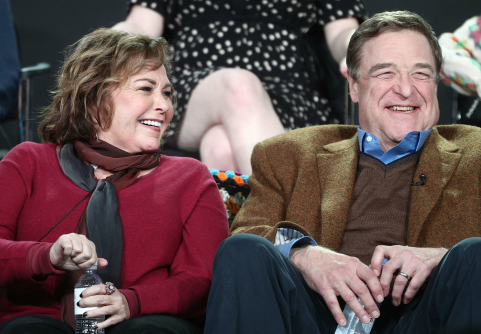 Roseanne Connor's political shift, resembling Barr's own real-world anthesis, is a hit with TV audiences. Last night's maiden episode garnered over 18.2 million viewers, the highest-rated sitcom broadcast on any network in over three years, according to the Hollywood Reporter. The show's viewership was the highest witnessed by ABC for it's 8 p.m. Tuesday night time slot since 2006. "Roseanne" dwarfed another rebooted show, NBC's more liberal-leaning "Will & Grace" in its first episode ratings. The NBC show's audience only managed to pull in 10 million viewers for its inaugural episode, even after much media fanfare. The "Roseanne" revival has had the entertainment industry abuzz for the past year. Barr, whose blue-collar appeal mesmerized audiences in the 1990s, opened up about the show's return to the New York Times. Barr said she wanted the revival to focus on how American families are struggling in the 21st century, much like the original focused on how they were struggling in the late-1980s and mid-1990s. The show plans to stay true to its roots, finding ways to intertwine comedy into the lives of an American family coping with life in an increasingly globalized and skilled economy. Barr said the show will continue to tell the types of stories that one wouldn't normally see on sanitized television. "Same jokes, same kind of thing," Barr said. "Just trying to get through paycheck to paycheck and handle it. Having no jobs and people losing their homes and you know that never, ever being talked about on television." The revival also plans to tread new ground on issues like the opioid epidemic, healthcare, the pervasive culture of political correctness, and the rise of Trump. "It’s about opioids and health care," Barr said. "How we deal with whole new issues that we didn’t even have before, like gender-fluid kids. How [the] working class … elected Trump." The 2016 election will be a focal point of the show, especially in regards to how family dynamics play in an ever-polarizing political environment. "I just wanted to have that dialogue about families torn apart by the election and their political differences of opinion and how we handle it," she said. "I thought that this was an important thing to say at this time." "It’s an accurate portrayal of these people and people like them," Barr added. "In terms of what they think and how they feel." The revival seemed to capture the heart of at least one high-profile fan. On Wednesday, the president's oldest son, Donald Trump, Jr., tweeted his praise for the show. Trump even suggested Barr should turn her creative endeavors toward late-night next. This entry was posted in Culture and tagged Donald Trump Jr., Jobs, NAFTA, President Trump, TV News. Bookmark the permalink.